Though it’s hard to believe, it’s already been a couple of years of carrying the Bullet 10L pack daily. This seemed like a good time to do a quick running update on how it has fared with every day carry / EDC duty. Since I purchased the Bullet 10L back in early 2015, there have been quite a few updates and design changes made by GORUCK. The model shown here is from their second-generation run, with 500D Cordura fabric, and a main compartment plus hydration compartment. Although its specifications state that it has 10L of cargo volume, I’d make a guess and say it’s at least closer to 12 or 13L in reality. Newer versions have gone back to 1000D Cordura, and there is no longer a separate hydration compartment. Instead, there is one large main compartment, now with a small sleeve and additional padding to help hold their weight plates for training. Also, the shoulder straps have now been sewn directly to the pack, and an embroidered logo has been added to the front. Personally, I think these changes are a bit of a downside for using the Bullet 10L strictly as an EDC and travel pack. You lose the hydration compartment (which was handy for flat items), gain more structure to the pack (so less compressible), and the transition to a thicker 1000D fabric means a little bit more abrasive of a material (and a fraction more weight to carry). However, if you’re into training and rucking, these are probably welcome improvements. 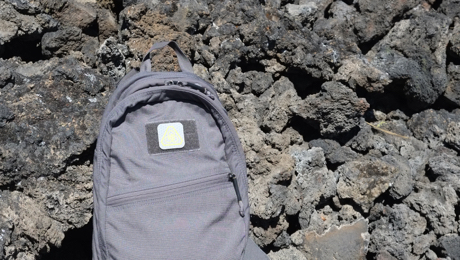 Overall, the Bullet 10L has done an awesome job as a daily pack. Its small size means that it can easily fit just about anywhere, it has enough capacity to carry the basic essentials, and it’s comfortable to wear for long periods of time, even when slung over one shoulder.